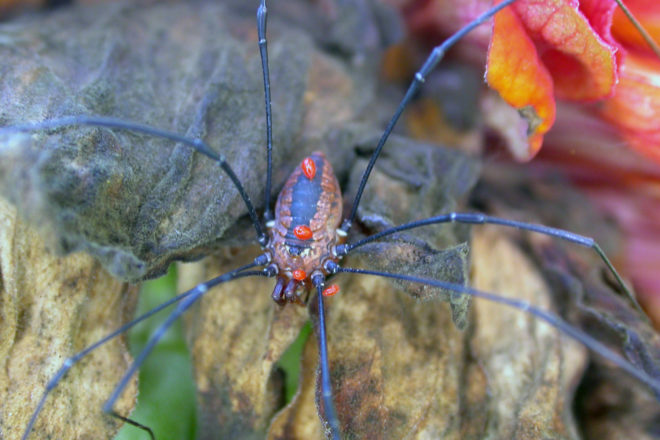 The harvestmen are frequently parasitized by red mites in the genus Leptus. Photos by Roy Lukes. Most people don’t like flies, mosquitoes, moths and especially spiders. The fact that spiders destroy millions of the despised insects every year is apparently unknown to those who dislike them. One scientist spent considerable time in calculating that the spiders in England and Wales kill about 22 trillion insects in a year. Perhaps that is why I have never been too concerned about a few spiderwebs in the house. One or two webs invariably exist within a couple feet of the front door on my house. I remember seeing a daddy longlegs that seemed to be caught in one of the webs. Knowing how beneficial they also are, I was about to help it escape from the spider’s snare when it suddenly began to move. 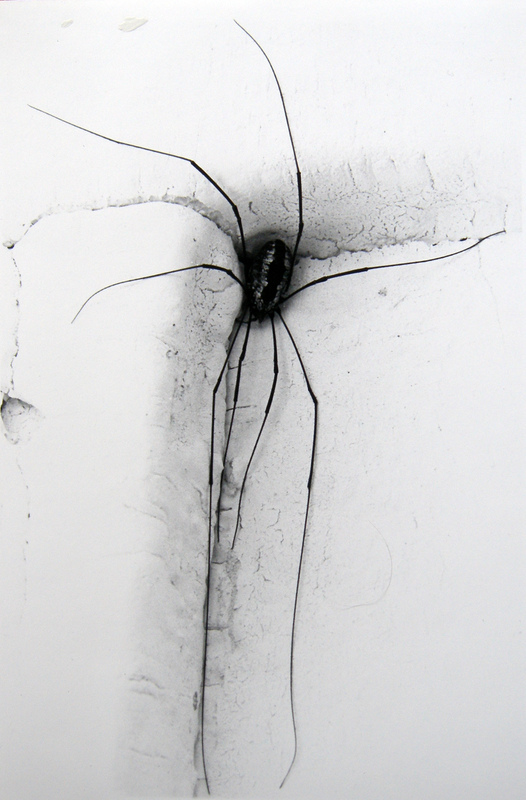 Its second pair of legs, the unusually long ones, formed into beautiful little hooks and the daddy longlegs performed what looked like a hand-over-hand escape to the side of the house near the door frame. A daddy longlegs will often rest during the day since it is a nighttime feeder. I’ve been seeing a few more in the yard lately but not as many as we found around the exterior of our home a number of years ago. I remember checking all areas on the outer walls of our home and finding 45 of the “stilt walkers.” The reason you may see many of them flattened snugly against the lower lip of the house siding during the day is that they feed primarily at night. Call them harvestmen, harvesters, grandfather greybeards, haymakers or daddy longlegs. They are all slow-moving, inoffensive animals that help people considerably by consuming large numbers of insects. If you wish to be technical, they are not true spiders, although they are classed with the Arachnida. Their head, thorax and abdomen are all grown together. Spiders have two distinct parts, the cephalothorax at the front, to which the legs are attached, and the larger abdomen toward the rear. True spiders have eight legs but also have eight eyes situated at the front of the head, all clumped together and many species produce silk. They also have two body parts unlike the harvestmen’s single pill-like body. There are cellar spiders that look similar but they are true spiders. The harvestmen are more closely related to scorpions than spiders. Spider or not, the “big daddy” deserves more respect and a closer look by everyone. I remember Roy examining the legs of a harvestman at our kitchen table. He inspected the second pair of legs, the longest, to look closely at all segments with a ten-power magnifying hand lens. The first joint, the coxa, resembles a tiny socket and is firmly attached to the body. The second joint, called the trochanter, is merely a little black knob and looks surprisingly like a small ornament. The third segment is the femur, similar to a human’s thigh bone. It is quite long, angled upward and gives the creature its stilt-like appearance. A tiny knobby “knee bone,” the patella, makes up the fourth segment. The tibia, like your shinbone, is relatively long and usually quite parallel to the ground. The last two segments, the metatarsus and tarsus, look like one unit and give this slow-moving predator its long-legged appearance. It is interesting to watch how delicately the two longest legs, resembling inquisitive “feelers,” can sweep the ground ahead as though reading the landscape for hidden danger. Actually, daddy longlegs’ eyes are also used for observation. What appears to be a very tiny, single eye resembling a minuscule wart located near the front of the body, contains two shiny black eyes. A ten-power magnifier is needed to see them well. Situated between the jaws and front legs are two small chelicerae (ki-LISS-er-ee). They have tiny hooks or claws on the end and are used to transfer food to the mouth or squash tiny insects so they can be sucked dry of body fluids. It is quite common to see a daddy longlegs with a leg or two missing, perhaps resulting from a close encounter with one of its predators, such as a bird, frog or a lizard. The missing appendages cannot be regenerated but these delicate creatures appear to maneuver just as well on six or seven as on all eight. Have you ever observed one of the daddies long enough to see it sit down? Obviously they must do so in order to capture their food. We have frequently watched two daddy longlegs performing very humorous “rumba” movements, waving their legs all the while. It finally dawned on us that one of them was really a mama longlegs. These fascinating creatures hatch during the first real warm spell of spring. They look like very tiny adults and molt several times during the summer. The extremely thin inside layers of the exoskeleton are first digested, making it easier for the animal to crawl out of its old “framework.” Look on the siding of your house or in the corners of the outside windows next summer and you will surely find the light tan exoskeletons of a number of daddies. Place a live daddy longlegs in a large jar along with a couple of drops of sugar water. How meticulously it will clean its legs, one at a time, by grasping them with one of its palpe and carefully pulling them through its jaws. While picking thimbleberries a few years ago I would see a harvestman practically wrapped around one of the juicy fruits with all eight legs, apparently feasting upon the nourishing liquid. They are, however, primarily insect eaters. They also will consume decaying vegetative matter. A female uses her ovipositor to deposit eggs as deeply as possible into the soil, where they will hatch the following spring. In several weeks, come the first hard killing frost, all that will remain of these wonderful friends of man will be their eggs, a viable source of those stilt-walking marvels of harvest time.